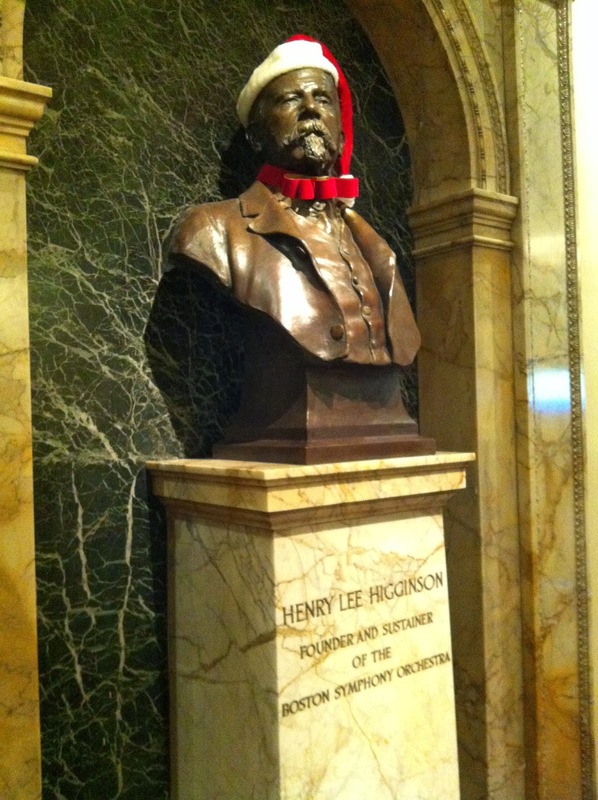 Henry Lee Higginson creates the Boston Symphony Orchestra May 23, 1889; Boston Monument; Merry Christmas to All! Henery Lee Higginson bust by Bela Lyon Pratt is just another tribute to great Boston leadership; this time in classical music. 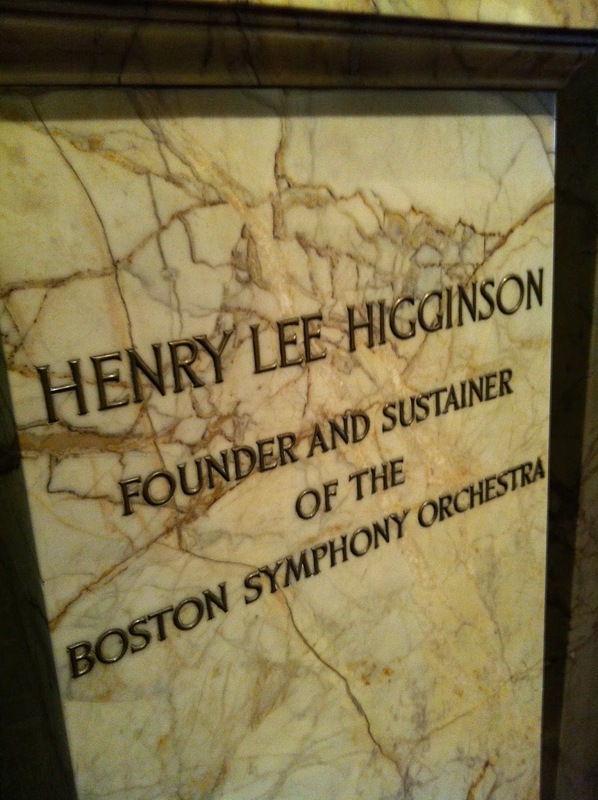 On March 30, 1881, Higginson published in Boston newspapers his plan for a Boston Symphony Orchestra that would perform as a "full and permanent orchestra, offering the best music at low prices, such as may be found in all the large European cities." He advised his first music director, George Henschel , to hire only local musicians for the first year so as to avoid creating bad blood in local musical circles. For the first season's series of 20 concerts, prices were set at $10 or $5 for the whole series. Single ticket prices were set at 75 and 25 cents. For the weekly afternoon public rehearsal, seats were unreserved and all priced at 25 cents. 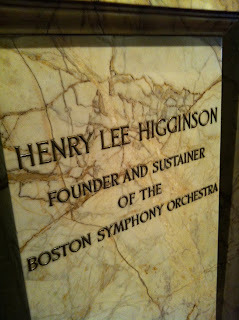 The concert venue was the Boston Music Hall and the orchestra would travel locally, offering concerts in such cities as Providence Portland, and Worcester, as well as several in Cambridge at Harvard University's Sanders Theathre.] Soon, to address concerns about the availability of tickets, 505 tickets for the afternoon rehearsal concerts were sold for 25 cents to those who joined the queue outside the hall in advance of the performance. Tours to more distant cities followed, starting with Philadelphia and then New York. Casual summer concerts began in 1885. "The scheme, half-baked, no doubt, was simply this: to give concerts of good music, very well performed, in such style as we had all heard for years in Europe; to make fair prices for the tickets and then open wide the doors." If you see Walter or Mengelberg, you will have to say to them . . . that I do know something about music, and that I have very distinct ideas as to how music should be played; that I shall not meddle with modern music, but that I shall certainly ask them to play the classics as they were played. I was brought up in the Vienna school (as you know) and there were plenty of men living then who had heard Beethoven conduct, as well as Mendelssohn, and knew how he wished his music given. I have known Brahms myself and heard his music. You know well enough what I wish, and I shall not interfere unduly with any of these men, but I don't want crazy work (such as sometimes even Nikisch gave us, and Paur gave us too often), and perhaps you had better tell them that I hate noise. Happy Holidays to all! "Boston Bronze and Stone Speak To Us" can purchased at Old North Church Gift Store, Best Sellers Cafe Bookstore, Malden, Amazon.com and Barnes and Noble book stores. My wife Jeannine and I visted my daughter Carolyne, in New York City, this December 10th during the most festive time of the year as many past and pop songs extoll. The Rocketts Christmas Spectacular, Radio City Music Hall, Rockefeller Center iceskating, the dancing Salvation Army bell ringers, the window shopping, comedy clubs and cozy foodie restaurants of Greenwich Village and SoHo were exciting and friendly. The spirit of kindness and generosity permeate the city this time of year. Another day is honored in bronze and stone 365 days of the year. The rememberance of the tragic 2977 deaths of people, from all walks of life, on September 11, 2001. Their souls are not forgotten. These people from all states, nations, races and religious beliefs were robbed of their Freedom of Pursuit of Happiness. Much thought and feelings have been incorporated in the construction of both the outside dark cavernous square waterfall fountains, where once the two World Towers once stood, housing thousands of people every work day. Many hours of community effort from all parts of America went into the fabricating of the 911 Remembrance Quilt hanging in the downstairs 911 Memorial Museum. Artists of all types have helped express all of our grief connected to this heinous act of terrorism. Lastly, photos of all victums are hang on the inner wall of this monument. Rising defiantly, above and next to this monument of bronze and stone, is the Freedom Tower, a beacon for all of us, for America, for Western freedoms and democracy. The Spirit of the Season and The Spirit of Freedom lives with all of us who allow the freedom of others. Happy Holidays From "Boston Bronze and Stone Speak To Us"
Our Monuments teach us, hopefully we will all learn from them.